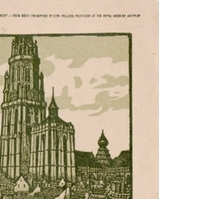 A postcard depicting a view of the City of Antwerp, Belgium. The tallest building in the postcard is the Cathedral of Our Lady, a Roman Catholic cathedral founded in 1521. Original 3 x 5 inch black and white postcard: ACC# SM-00-243, file folder 1A (non-U.S. blanks), box 10A, Lucile (Mary Lucile) Campbell Collection, UCF Public History Center, Sanford, Florida. Rynck, Patrick de, and Fiona Elliott. The Cathedral of Our Lady in Antwerp. Ghent: Ludion, 2005. “Under the Tower Postcard.” RICHES of Central Florida accessed April 26, 2019, https://richesmi.cah.ucf.edu/omeka/items/show/6662.